Honors Program students recently traveled to San Francisco, where they visited some of the biggest names in technology, including Google, Facebook, and LinkedIn. 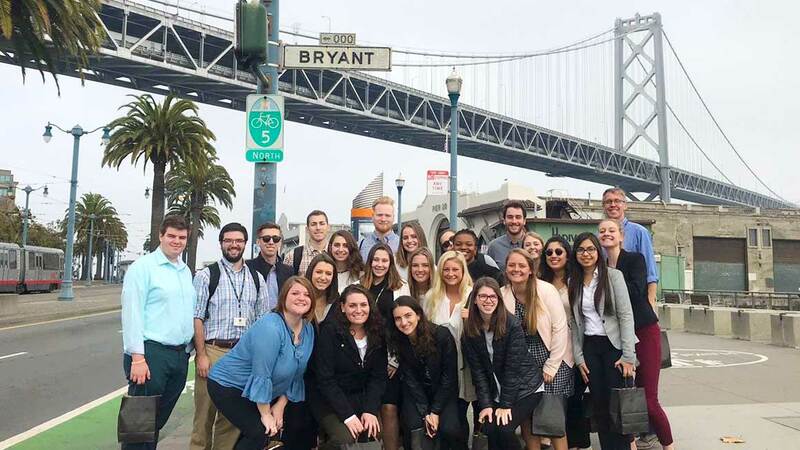 A list of some of the most prestigious names in tech, including Splunk, LinkedIn, Facebook, Salesforce, and Google, could also double as an itinerary for the Bryant Honors Program’s recent trip to San Francisco. Over the course of five days, 23 Honors Elite students explored the companies that shape our lives and made invaluable connections with faculty, alumni, and each other. The annual Honors trip offers Bryant’s Honors Elite, students who have been with the program all four years and have committed to completing an Honors thesis, a chance to explore. The trip combines site visits, networking with industry professionals, and cultural explorations such as this year’s visit to Alcatraz Island and a winery tour with George Dooley Jr. ’78, who helped introduce students to the region and shared stories of his time at Bryant. "You hear so much about these companies and you have so many expectations but getting to see them first-hand surpassed all of mine." “The trip is designed to expand their horizons, it expands their view of the country, it expands their view of culture, it expands their understanding of business and what these businesses do and it expands their relationships with alumni,” said Associate Professor of Marketing and Director of the Honors Program Jane McKay-Nesbitt, Ph.D. The Honors Program has previously traveled to New York, Chicago, and Washington D.C.
Over the course of five busy days, the students, accompanied by Professor of Science and Technology Kevin Mentzer, Ph.D., and Associate Professor of Marketing Sharmin Attaran, Ph.D., engaged in a whirlwind tour of some of San Francisco’s biggest tech companies. The sites were carefully chosen for the trip and the visits were made possible through connections with faculty, alumni and the families of current Bryant students. Faculty and alumni supporters of the Honors Program also contributed money to help defray the costs. At Google, for instance the students met some of the 14 Bryant alumni who work at the mulitnational technology company, networked with staff members, toured the company’s campus, and attended breakout sessions on topics such as privacy, marketing, staffing, YouTube, and finance. “You hear so much about these companies and you have so many expectations but getting to see them first-hand surpassed all of mine,” said Kaur.